Ready-to-use optical panels for the most diverse Lighting applications. FIRST and UNIQUE Optical System using 15 DIFFERENT CORE OPTICS with DIFFERENT GEOMETRIES in the SAME SYSTEM. This makes virtually possible to customize any application. 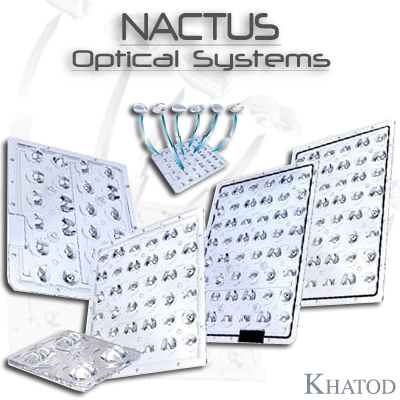 NACTUS Optical System available in multi-lens arrays, from 4 to 12 - 24 – 36 – 48 - 60 - 72 optics. Designed for LEDs of latest generation, from 100 lm/W to 300lm/W. The optics, made of PMMA, PC and Silicone, UV protected, never come in contact with the LED or the PCB. Easy assembly: insert the screws into the perimeter holes and fasten the module to the PCB. Preset for the housing of sensors. Available with PCB for testing. The LEDs of latest generation - COB LEDs – achieve very high temperatures which could put strainon the conventional polymers such as PMMI, PMMA and PC. The typical features of silicone make silicone lenses perfect for outdoor applications or indoor applications in damp and wet environments. Optimized for most popular COB LEDs. Designed for Street Light applications, comply with IESNA Standards: Type I - Type II - Type III - Type IV - Type V, Short or Medium light distribution depending on the LED used; ME3a. Excellent in any application in Wide Area Lighting, Outdood and Indoor. Preserve and enhance the typical characteristics of silicone. Engineered for Street Lighting using most popular Multichip LEDs, deliver excellent performances also in any application in general lighting, in wide and high-bay areas. 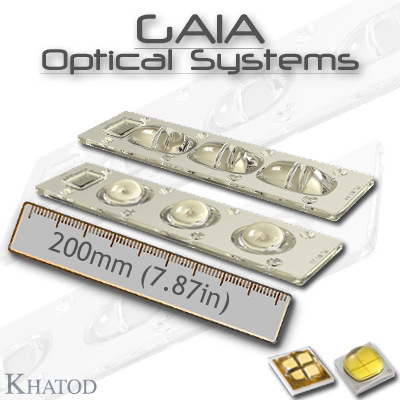 GAIA is a linear lens-array made of 3 Free Form Optics that perform as a real single lens. New-concept optical system, ready-to-use for the most diverse Lighting applications, Indoor & Outdoor. 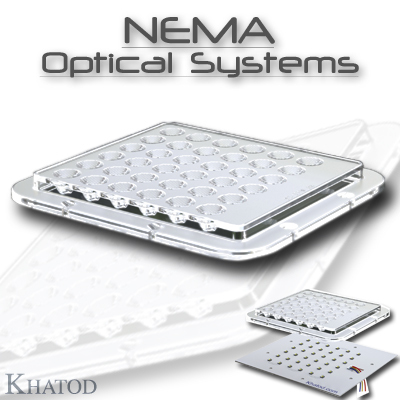 NEMA Optical System is a panel made of 36 optics designed for most popular Power LEDs. NEMA SYSTEMS maximize the light flux from the Power LEDs through its optics, so creating a perfect and high-efficient beam typically characterized by the NEMA standards. The high optical efficiency of NEMA SYSTEMS combined with the high intensity from the Power LEDs lead to an optical system able to guarantee high lighting performance while being a real cost-effective and energy-saving optical solution. GALILEO Optical Systems is a ready-to-use module holding the optics, mounted and directed according to the requested specifications. The optics forming GALILEO are the core of the product: by mounting and directing them while each module is produced, it is virtually possible to customize any application. You do not need to mount and direct hundreds of single lenses in different beams in order to realize the pattern desired. That is our task: GALILEO is a new-concept optical system, a single module, conceived and designed for immediate application in your lighting fixture. The panel holding the optics is clear fine-frosted finish. 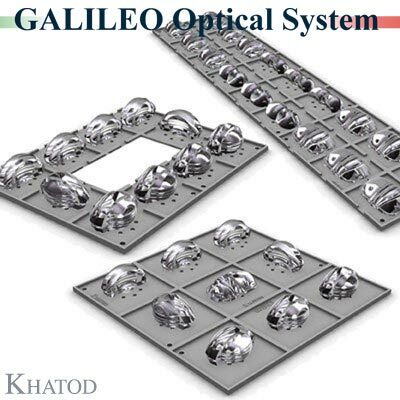 GALILEO Optical Systems is available in two standard array layouts where LED to LED pitch can be 50,8mm (2 in.) and 40 mm (1.575 in.). Both the array layouts are realized in many different standard configurations covering virtually 90% of the requirements for any lighting applications: from Street Lighting, to Outdoor and Indoor Lighting and Industrial Lighting. GALILEO Optical Systems is Patent Pending. 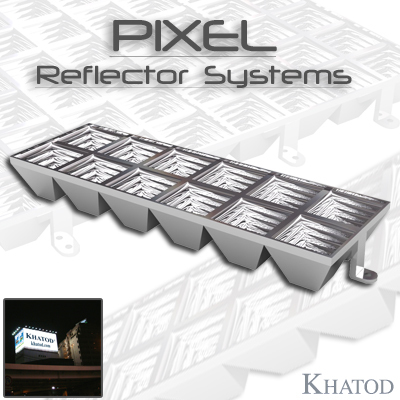 Multi-reflector arrays, consisting of 6 to 12 square-shaped reflectors, made of PC. Typical square beam angle; high performance with warm white LEDs. Positioning pegs enable easy assembly. Allow multi-module configurations by placing the arrays side by side. Any application in wide area, architectural and street lighting. Excellent for billboard applications. BARSIX delivers the on-hand solution for immediate application in your lighting fixtures. 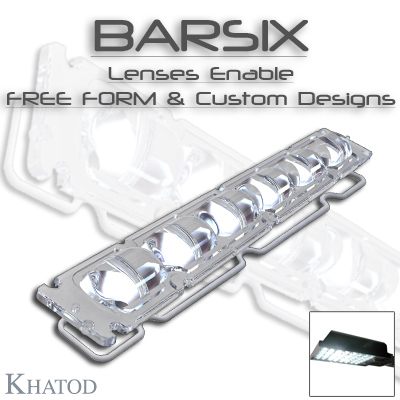 As the name tells, BARSIX is an optical bar made of six lenses. The bar is clear fine-frosted finish while the optics are clear gloss. The optical bars can be combined together by placing them side by side up to a max of six bars. This offers the opportunity to create your own optical module and form the structure you prefer. BARSIX is IP protected, rating IP65: a silicone gasket placed in the special groove all around the perimeter edge ensures protection against powder and water penetration, making BARSIX perfect for any outdoor application. BARSIX comes with the silicone gasket placed. Also, BARSIX complies with IESNA TYPE III, TYPE IV, ME3 Standards making this exclusive optical solution absolutely fitting for any application in Street Lighting. While being a high-tech product, BARSIX delivers the most simple design to individuals who need to engineer their own applications. Many standard modules combining from 2 to 6 optical bars are available from stock, or you are given the opportunity to buy any number of single optical bars and create your own optical application. BARSIX gives our customers the great business opportunity to use our best expertise in LEDs and our most advanced technologies in lensing enabling them to create their applications without any development cost. 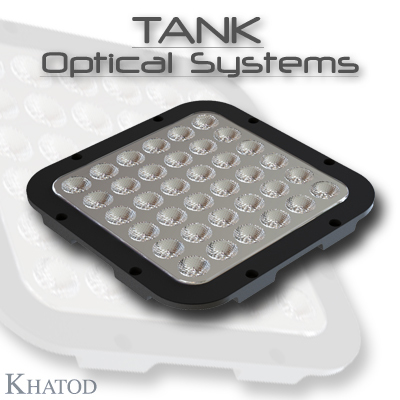 TANK is a perfect Optical Solution for meeting the most demanding LED Lighting applications in a wide range of environments. Construction, manufacturing, and Industrial areas as well as events and emergency operations areas, are some of the most common uses where KHATOD TANK performs at its best. TANK is available IP protected. TANK is perfect to be used in light towers as well as in applications where portable lighting is required.